What's it like to daily drive the R-Spec sedan? I test drove a couple base models and liked a lot about them, but they just handled too much like a couch on wheels and felt too damn big. Does the R-Spec correct some of that while not beingtoo much for stop and go city driving? I test drove an R-Spec before buying my 4.6. The R-Spec does have a firmer ride, but it still feels damn big. I think it depends on how smooth the roads are where you live - the R-Spec is pretty uncomfortable on rough surfaces. It sounds like you want a sports sedan, and the Genesis, even in R-Spec, is not that - it's a big GT car that is perfect for cruising down the highway and making long trips comfortable. For context, I daily drove a 2000 Mazda Miata before buying the Genesis, so I am used to a firm ride and tight handling. I reviewed both in the past, and fully agree with the first response on the R-Spec. The second-generation Genesis handles and rides with much more precision than even the R-Spec of the first-generation, but it still feels big. For a car that feels smaller you really need a smaller, lighter car. 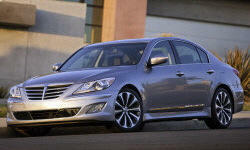 In 2012 I went from a 250hp, 2200lb convertilbe to a V6 Genesis Sedan becuase I need 4-doors. In 2015 I test-drove a 2015 V8 for a week. I couldnt stand the new body style, cockpit complexity or the additional 500 lbs. So I traded my '12 in for '14 R-spec. I agree with the other postes in that It's no "sport sedan". As a former weekend auto-crosser I can say the R-spec needs to be driven hard to get the most out of the suspension but its not "tossable". I also wouldn't consider it to have a luxury car ride. It exhibits much less bodyroll and generaly wallowiness than the V6, has none of the wheel-hop of the 2nd generation and never loses its composure over rough roads. But it can be harsh yet resilient. I've hit a big square hole at triple-digit speeds and was certain I bent a wheel but no.